Chittagong Division area 33771.18 sq km, located in between 20°43' and 24°16' north latitudes and in between 90°32' and 92°41' east longitudes. It is bounded by dhaka and sylhet divisions on the north, bay of bengal and arakan (Myanmar) on the south, Mizoram, tripura states of India and Chin state of Myanmar on the east, Dhaka and barisal divisions on the west. There are many lofty hills in Rangamati, Khagrachhari, Bandarban and in the eastern part of Chittagong districts. Population Total 24290384; male 52.03%, female 47.97%; Muslim 79%, Hindu 12.65%, Buddhist 7.08%, Christian 0.84% and others 0.43%. Water bodies Main rivers: meghna, matamuhuri, titas, dakatia, gumti, feni, karnafuli and sangu; Sandwip, Hatiya, Kutubdia, Maheshkhali and st martin's island are notable. 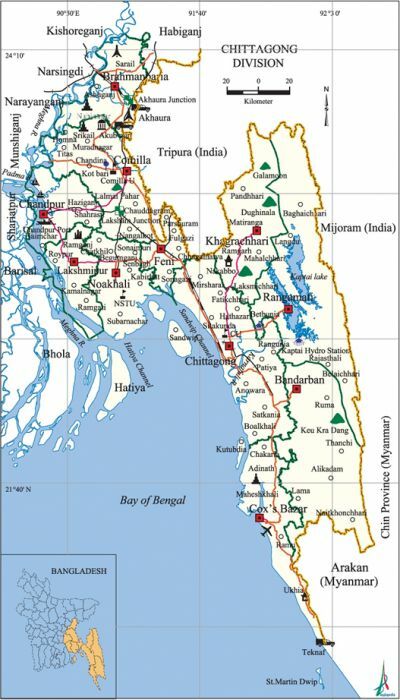 Administration Chittagong Division was formed in 1984 with 11 districts as a result of the administrative decentralisation. The greater Sylhet district was separated from Chittagong Division with the formation of sylhet division in 1995. Chittagong Municipality was established on 27 June 1977; chittagong city corporation was formed on 31 July 1990. Religious institutions Mosque 34025, temple 1402, church 175, tomb 609, pagoda 162, Buddhist Vihara 4, sacred place 9. Main sources of income Agriculture 47.94%, non-agricultural labourer 4.80%, industry 0.9%, commerce 14.38%, transport & communication 2.82%, service 11.93%, construction 1.88%, religious service 0.34%, rent & remittance 4.65% and others 10.80%. References Bangladesh Population Census 2001, Bangladesh Bureau of Statistics; Cultural survey report of Districts and Upazilas of Chittagong Division 2007. This page was last modified on 12 October 2014, at 12:18.